Autocar India has come out with a comparison between Grand i10 and Ignis. According to them both the cars have their strong and weak points, however as a package on the whole, along with better pricing Grand i10 is declared the winner. 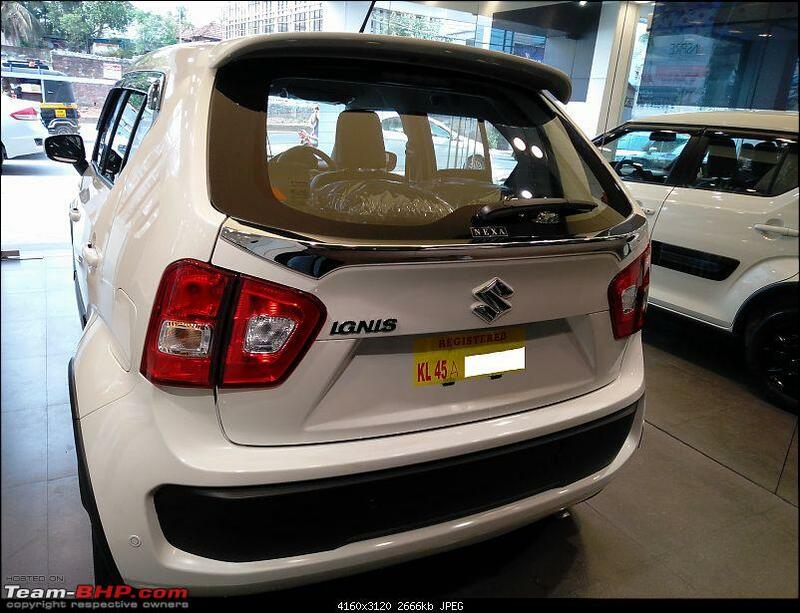 "CarandBike" has come out with a comparison between Grand i10 and Ignis. 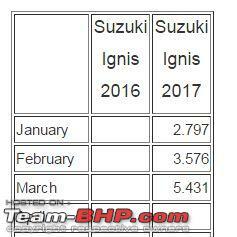 According to them Ignis stays ahead compared to Grand i10. Maruti Suzuki Ignis has been declared the winner. Last edited by vij : 24th April 2017 at 20:55. I wanted to take delivery of Petrol Zeta AMT by 30th of this month as 1st May is my marriage anniversary . Sales rep at Nexa, Dwarka Delhi is promising to deliver by that time and I am thinking of making the booking tomorrow. Now I am just wondering that if I get the delivery by Sunday 30th April, it will be extremely quick and hence, I have few queries. 2. Car registration happens after PDI or before it? 3. Considering that Nexa Gurgaon and other outlets are quoting waiting of 1 month, I am slightly skeptical. Though my colleague booked his Ignis Zeta last week and took delivery in 4 days. Any idea whether the HU of Zeta can be replaced with the HU of Alpha or any other touchscreen unit? I was looking for a Ignis Zeta AMT which comes with the non-touch HU only :( . 1 and 2 . PDI to be done before registration. 3. I think Ignis is not selling as mush as anticipated. I enquired with Nexa in Kolkata, they cited 6-8 week delivery time. But after a week I received a call from the dealer stating that they have two Zeta AMTs in stock and can deliver immediately. Last edited by archat68 : 25th April 2017 at 11:36. Seen this when I visited NEXA to test drive IGNIS. Though the rear looks outdated or rather ugly, with the spoiler and the chrome lip, the back view is sort of acceptable. I am looking for a replacement for my Dad's 2003 model Alto. The models considered are Wagon R, Tiago & KWID Climber. He is comfortable with Wagon R and is saying Wagon R has better overall visibility from the driver seat and it is easy to enter and exit. Compared to Wagon R, I feel Ignis is a better deal as it is easy to handle with superlight clutch, smooth gearshifts and offers better safety features and space. I am thinking of opting for Delta which is Rs. 6.16 L OTR in Kerala. The wagon R Lxi costs Rs. 5 L OTR, so considering the features I don't think IGNIS Delta is much overpriced. I am thinking of opting for Delta which is Rs. 6.16 L OTR in Kerala. The wagon R Lxi costs Rs. 5 L OTR, so considering the features I don't think IGNIS Delta is much overpriced. Agree completely. With that extra 1.1L, u get a car from the next segment built on a newer platform, a better 4-cyl engine, better features, build quality, ride quality, handling, crash worthiness and fresh design. Last edited by romeomidhun : 25th April 2017 at 19:38. I took a test drive in one of these Ignis here in the Netherlands. It was the so called “Style” version. Which has some visual and some technical tricks. E.g. lane departure warning, re-generation on braking, camera brake support etc. Now, bear in mind I am 1.93 m tall. So I was very pleasantly surprised to fit properly in this little car. Even more so, with the driver seat in my position, I could still climb in the rear seat too! Quite amazing. These rear seat are adjustable too. You can move them forward to increase luggage space in the rear. I drove around the The Hague area for about 35-45 minutes. Some motorway, some rural and some city driving. I think this little car is a hoot to drive. With these little Japanese cars you just bury your right foot and when a bend/curve/corner comes up you never ever brake! You just chuck it around the corner! Great fun! Nice little nippy engine too. Compared to our Fiesta, this car is smaller, cheaper to insure, cheaper to run (more fuel efficient), cheaper on road tax, tighter turning circle, faster and although I always like the way the Fiesta handles, this Ignis is just a lot better and much more fun! I just love these little cars. We have a Ford Fiesta for the wife, but I would trade it in for this little gem immediately. So negotiations are ongoing! My wife has the “killer argument”. The Ignis doesn’t have front window heating. So I might have to promise to scrape her windows for the next couple of years when it has been freezing! I must admit that the Fiesta feels a bit more safe in the sense that it is a big bigger, meatier and so. Whether it actually is, remains to be seen. Even so, the Ignis is a small car and you don’t want to be battling it out with anything larger. Which is anything beyond a motor cycle and a Smart. Also, I already have four cars for me and my wife only one car for her. So she might not agree on principle her car should comply with my wishes. So, maybe I’ll just get one for me! Suzuki's Ignis seems to be an instant hit in Europe. for reasons you have mentioned. Just a little short of Vitara sales. I took a test drive in one of these Ignis here in the Netherlands. ....With these little Japanese cars you just bury your right foot and when a bend/curve/corner comes up you never ever brake! You just chuck it around the corner! Great fun! How is the steering on the EU version? That was the only reason for complaint when I drove it over here. I love the little Ignis, just wish the steering was a bit more like that of the Swift than i20. Then, we will be able to have even more fun with those four wheels pushed as far as outside. How is the steering on the EU version? Pretty tight and responsive. Just the right amount of feel and feedback. It’s one thing they have messed up on the new Ford Fiesta. I never quite like it as much as I did on the earlier models. The power assistance seems to be lacking behind all the time. A tyre change to a broader one will make the steering more "heavy" (and more planted feel on the curves), IMO. Experiencing that after my upgrade from 165/80 R14 to 185/70 R14. I had enquired about the Ignis and was told there is a waiting period of eight to ten weeks. Baleno has a twenty weeks waiting but can expect the car in around 12 weeks. Then the SA says they do have Ignis in stock and can deliver immediately. Now is Ignis really having a demand or is the waiting time artificial. The SA's also seem to indicate to book the Baleno and steer clear of the Ignis. The SA's also said most of the customer are saying the Ignis would project a kinda cheapo image and they are not too keen on it! Well to be frank even my wife says the car for eight lakhs looks like a toy! I personally love the car , except for the weird back side! I am looking to buy a car immediately and am considering Ignis petrol Alpha and wife wants the Honda Jazz - V CVT. Would decide on the same by this weekend. I booked Zeta AMT at Gurgaon where waiting period quoted by SA was one month, while my Colleague bought Zeta (non AMT version) petrol from Delhi with waiting period of 4-5 days. So I believe it is to do with messed up distribution of inventory. That said, I do not think Ignis is much in demand and I would see delivery period settling down to 15 days in coming months. Looks are a personal choice. I do not like the look of Ignis; still buying it as looks doesn't matter much to me and I find it VFM compared with Celerio or Tiago. Comparing Ignis Alpha with Jazz CVT would be unfair as both are from different segments and moreover you are comparing a manual car with a automatic one. Last edited by roushan84 : 3rd May 2017 at 14:15. I booked a Ignis Delta AMT today after a tough decision call between the Tiago AMT and the Ignis AMT. I made the booking at NEXA Museum Road in Bangalore and the Dealer has promised delivery before the end of this month/last week of this month. He did have the Tinsel Blue and White colors available immediately but I decided to wait for the Uptown Red. Pretty tight and responsive. Just the right amount of feel and feedback....It’s one thing they have messed up on the new Ford Fiesta. That's really amusing to note. The review of Ignis from UK states the steering feel as almost like what we have in India. Mind you, the rest of the car isn't so keen, because its steering is rather slow, vague off-centre and inconsistently weighted, while there's pronounced body roll in corners. And I love Fiesta' EPS unit. Guess we both are looking for different things here. A tyre change to a broader one will make the steering more "heavy" (and more planted feel on the curves), IMO. I am not really looking for weight or heaviness here, but a more predictable setup like in the Swift for example. Even lower variants of Swift with relatively narrow rubber (compared to stock Ignis) give a better feel through the steering wheel at city speeds. All times are GMT +5.5. The time now is 01:58.